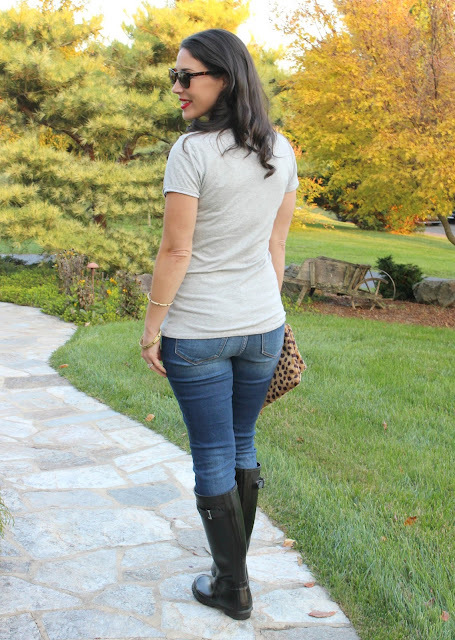 Today's post is all about the PERFECT gray tee. I have a tough time finding a good quality t-shirt that doesn't shrink, stretch out, or rip. I'll find one I love and after a few wears, I'll notice a small hole. This has happened so many times (ugh)! Well, my friend Carly of Thirty Something Fashion felt the same way, so she created her own t-shirts, made right here in Pennsylvania! How cool is that!? What's even more awesome is that for every tee sold, she donates $1.50 to K.Hovnanian Children's Hospital in New Jersey. When Carly asked if I wanted to try out her new tee, I jumped at the chance! I couldn't be more impressed with the fit and quality of this shirt. The material is so soft and the fitted shape is very flattering. The v-neckline falls at just the right spot and I also love how the tee is thick enough that you don't need a cami or tank underneath. Thirty Something Tees come in two colors, gray and white. The gray runs slightly smaller than the white, which is more of a relaxed fit. Both tees cost $48 and come in sizes XS-XL. Trust me, this t-shirt is worth the investment, and the best part is that it gives back to the community! I wanted to share a few ways to layer this tee. 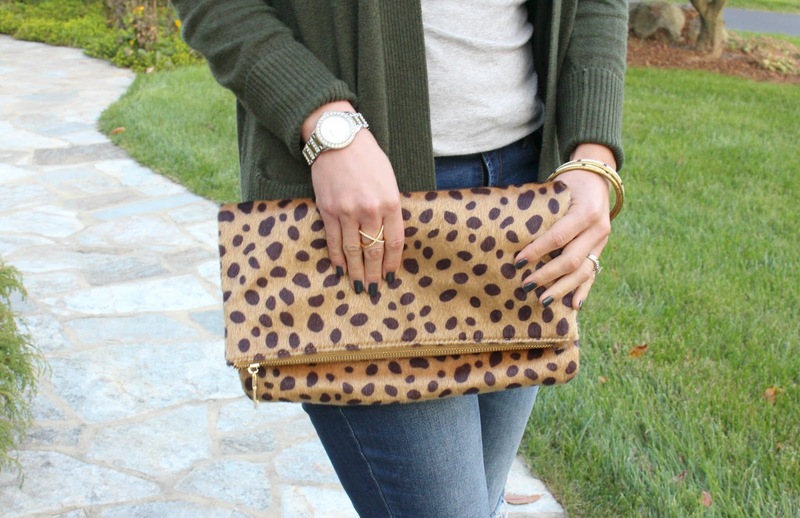 It looks great alone, but for this time of year, it fits perfectly under cozy cardigans! 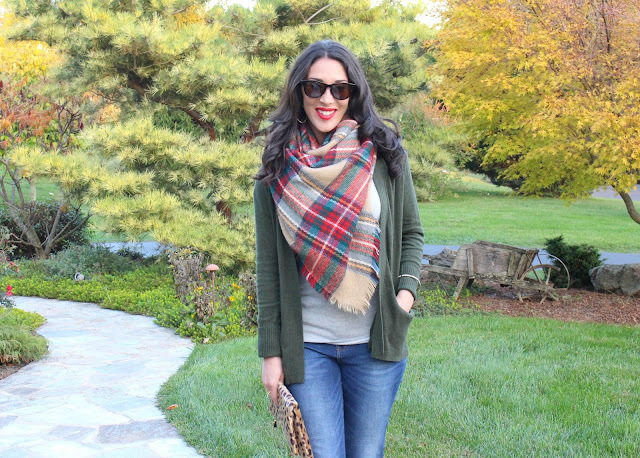 I wore my new 'go to' olive cardigan from Kohl's. This Sonoma Goods for Life cardigan is lightweight and great for the fall season. It comes in several colors and is currently on sale for $17.99! 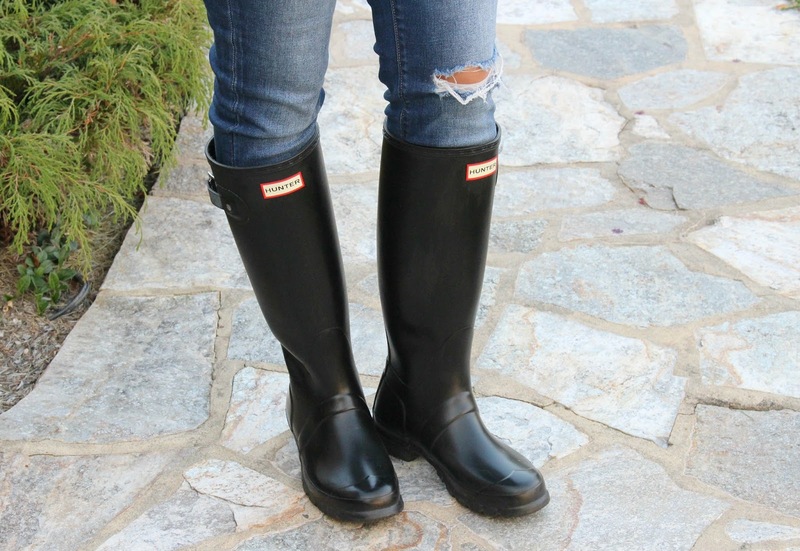 My Hunter Rain Boots were a birthday gift last year and I've gotten SO much wear out of them! They are perfect for fall and spring, and I wear them a lot in the winter with a thicker sock for warmth. I'm wearing the matte black in a size 7, for reference. I do recommend matte over glossy...my mom has a glossy pair and they need to be cleaned way more often. 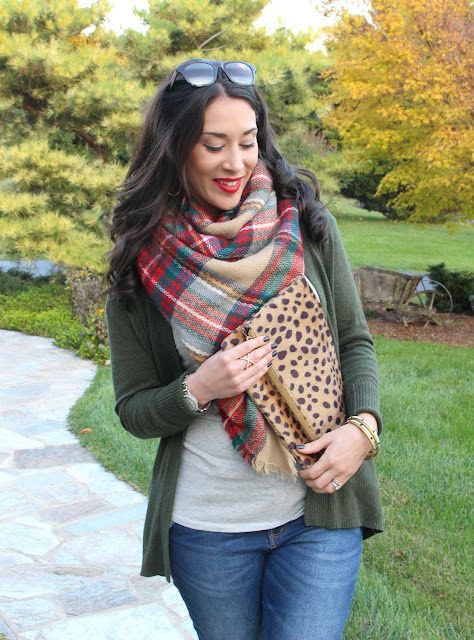 Another way to layer a tee for fall is by adding your favorite scarf. 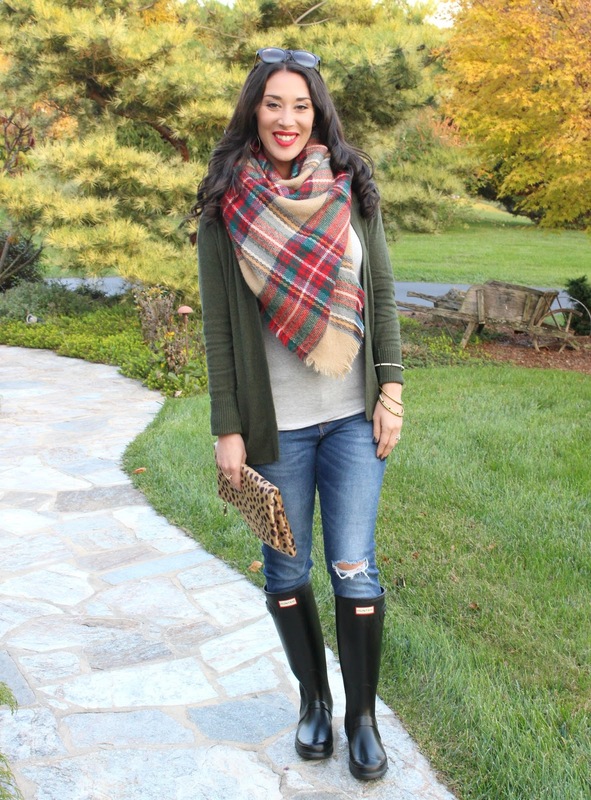 I went with my plaid fringe blanket scarf from SheIn. I absolutely love the colors! The cardigan pulls out the green in the scarf and the red matches the logo on my Hunter boots. Here's a look at the full outfit. The scarf really ties the whole outfit together! By the way, this blanket scarf is super affordable at just $15.99. Another fun trend in today's outfit is pattern mixing. 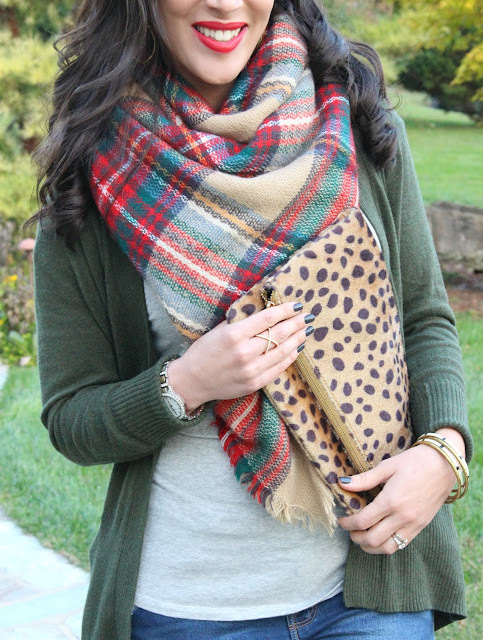 I've seen other bloggers combine plaid and leopard before, and I adore this combo for fall. Here's some tips for pattern mixing: choose only 2 or 3 patterns and have a similar color scheme. Thanks for stopping by and be sure to check out Thirty Something Tees! I like how to took a simple item that everyone has in their closet, such as a tee, and reminded us that a plain tee, layered the right way can really make an outfit. I like all three options, especially with the blanket scarf. Love it! Looks like it's well made and I love how you've styled it. This tee is amazing!!! I have been wearing mine NONSTOP. I love how you layered it with the cardigan and that GREAT blanket scarf. Such a chic and perfectly Fall outfit!! Such a simple, but great outfit. Love the scarf and how fashion gives back! First of all that is the perfect tee. I love how layers can build up an outfit for Fall. The tee in itself is great and looks so chic and cozy with the cardigan and blanket scarf, Tamara. A great tee shirt is essential for any wardrobe! This looks great! 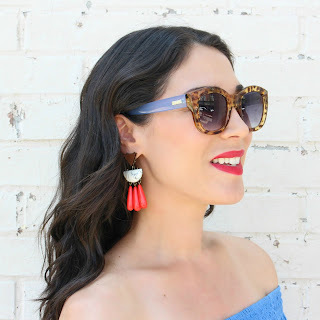 I love the way you styled it! You look AMAZING in my tee! I love it. Especially with the dark green. What a great unexpected combo. Scarf really ties it altogether. Thank you so much for featuring! !